Sometimes you can find a tea room that runs as smooth as glass. Friendly service, tidy tables, tasty nibbles, and perfectly decanted tea define Lovejoy's. This tea room specializes in English pub-style meals and afternoon teas served in the English tradition. With twenty-five kinds of tea to choose from, it's not an easy task to decide which type should fill a teapot! 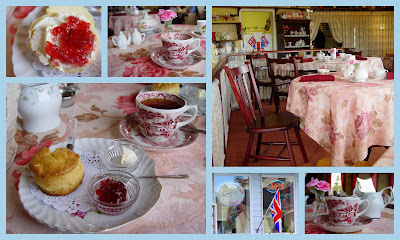 Betty's Tea Room Blend, the house tea, makes the decision easier --- and with a lovely scone and strawberry jam --- the perfect 'cream tea' is enjoyed. Lovejoy's by the sea. . .
Oh how I want to be there!!! Tea is always served with grace and style here! I am loving your collages. Now where is Lovejoy's? Sounds like my kind of place!! I love all those special things! Pretty pictures! Hi Sweet Friend!! Lovely collage! Everything you do is lovely!! Hope you have a Happee Friday!! It sounds like a wonderful place. The pictures are lovely. I hope someday to go to a tearoom. That would be so much fun!! Thank you for sharing.